Perfect Colours are proud to announce a new distribution agreement with Blackman & White, for the VersaTech and Mastercut ranges of digital cutters.Unlike other digital cutters all devices are precision manufactured in the UK and are available in a large number of different formats. 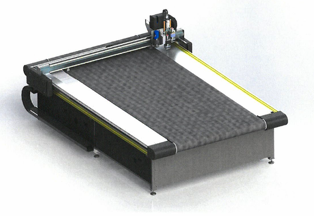 The 1.6M x3.2 devices can be made bespoke to individual customer requirements.Staring at just £50,000 these digital cutters provide a total digital cutting solution and are a great alternative to some better known brands. Jason Burroughs ( Perfect Colours MD) comments "These digital cutters are all made in the UK to order .Buying British is always an advantage to deliver lower costs, lower emissions and higher levels of service for our customers. These devices have a proven track record of quality and reliability with some of the largest digital providers in the UK. We are happy to speak to anyone with a potential requirement for this type of equipment, if you are interested please call: 0845 680900 or e-mail us: info@perfectcolours.com"
Prev← Perfect Colours Scoops 2 Awards at HP Dealer Awards.